Former Hatters midfielder Cameron McGeehan has been called up by Northern Ireland for their upcoming International Challenge matches against Panama and Costa Rica. The 23-year-old, who made 106 appearances for Luton, scoring 31 goals, before signing for Barnsley last summer, was selected by boss Michael O’Neill after impressing while on loan at Scunthorpe United. 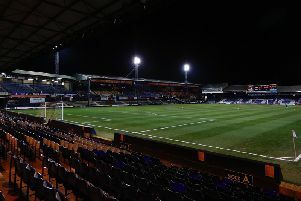 However, that appears to be water under the bridge now, as on his recognition, speaking to the Tykes official website, McGeehan said: “Ever since I have been injured I knew they were keeping an eye on me and my progress. “I had a phone call after the Millwall game in the early part of the season but it was all just a bit too early because my leg still wasn’t in the best way and I didn’t want to jeopardise anything at Barnsley. McGeehan played 10 times for Barnsley, scoring once in the Championship, before moving to Scunthorpe on loan, featuring in 14 games, bagging his first goal in their 2-2 play-off semi-final first leg draw against Rotherham last week.